a·ro·ma·ther·a·py — The use of selected fragrant substances in lotions and inhalants in an effort to affect mood and promote health. 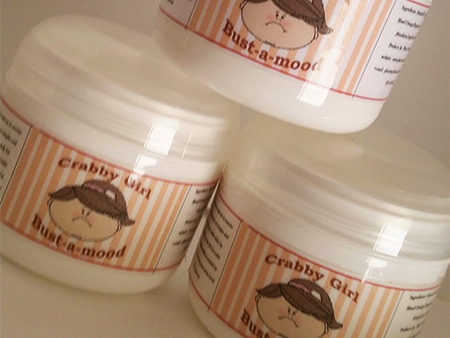 I’ve been working on several new blends of our Crabby Girl collection and our Bust-A-Mood is now available on our site. The Crabby Girl Headache Buster-Balm will be out soon. Bust-A-Mood is a blend of powerful citrus, mood altering oils that when inhaled through the nose area, stimulates the part of the brain connected to the nerves that help your sense of smell. A signal is sent to the limbic system of the brain that controls emotions and retrieves learned memories. This causes chemicals to be released which make the person feel relaxed, calm, or even stimulated. Balms made with Beeswax have more staying power than applying in oil form and once applied to the area usually affect the brain within 45 seconds. The Citrus Oil are uplifting and refreshing, but also beneficial in balancing our moods emotions and nerves. If you research Orange Essential oils being used by dentists to calm patients, you may be surprised with the the findings. I’ve also added Lavender Oil, to the blend as it’s vital to help balance emotional overload and has a calming effect. Click here to order Grumpy Girl Bust-A-Mood Balm today!